This accusatory rhetorical posed by Clive Palmer in a parliamentary debate on Monday has been the talk of the town this week. As part of a much longer speech criticising the Abbott government’s Paid Parental Leave scheme, Palmer singled out the Prime Minister’s Chief of Staff, the nationally respected (if a little begrudgingly by those on the other side of politics) Peta Credlin, implying and later outwardly stating that she had used her influence over Abbott to push through a policy for her own benefit. The comments were condemned by politicians on both sides of the chamber as not only sexist and inappropriate but downright cruel given the fact that Credlin has been open about her struggle to conceive and her experience with IVF. But Palmer has refused to apologise, claiming that it would be ‘naive’ for anyone to think that the Chief of Staff to the PM didn’t have an influence on policy decisions. He also said that he hadn’t know about her struggles with IVF, but when asked by 7:30’s Sarah Ferguson whether he would apologise now that he did know the best he could offer was the ultimate non-apology of expressing regret for any pain that might have been caused. More interesting than Palmer’s inappropriateness, or the fact that his statement was factually inaccurate (Commonwealth Public Servants like Credlin are already entitled to tax payer-funded paid parental leave), has been the response to Palmer’s comments by right-wing political commentators Andrew Bolt and Miranda Devine. 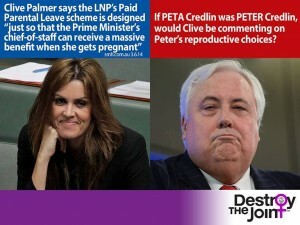 What’s been lost in the kerfuffle surrounding Palmer’s comments, however, is that the Paid Parental Leave scheme is in fact an unfair policy, and some of Palmer’s (non-sexist) criticisms of it are completely justified. The way the scheme is set up, women would be paid their full salary for up to six months of maternity leave, as opposed to getting the equivalent of the minimum wage as they would under Labor’s policy. While that may seem great on paper, it means that women on higher salaries who may be less in need of financial support during their leave will be entitled to more money than those who earn lower salaries and are likely to be struggling. It’s not needs-based policy – although neither is Labor’s – and like some of the other announcements in the recent budget it will disproportionately affect women who are already worse off. And as Palmer rightly pointed out, it will also discriminate against women who spend more of their time doing unpaid work such as caring for other children or working on the family farm. Which begs the question, have we all been missing the point by arguing about the adequacy of feminists’ response to Clive Palmer when we should really be talking about how the policy will affect Australian women? Sure, let’s call out sexism where we see it, especially when it’s done in the highly visible realm of national politics, but as feminists we should also be concerned with the way government policies will affect the lives of women more generally. As Sarah Ferguson told Clive Palmer on 730 in her trademark I’m-not-angry-just-disappointed voice, “by using this kind of language, it actually detracts from the things that you want to talk about”. By spending our time talking about Clive, are we missing out on a more important conversation? This entry was posted in Feminism, Politics and tagged featured, paid parental leave, politics. Bookmark the permalink.